Sam's handmade cards: A 65th birthday card for a friend's husband 65th. 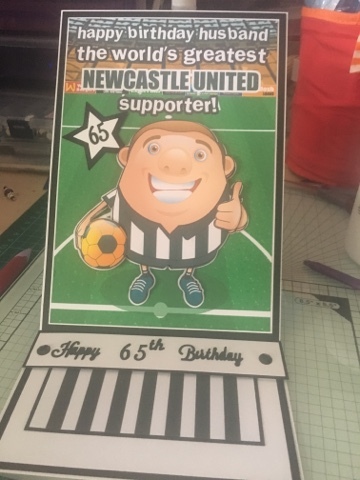 A 65th birthday card for a friend's husband 65th. After being busy at work and doing loads of overtime. My line manager asked me to make her a birthday card for her husband's 65th birthday. Also he is a Newcastle United supporter. So I quickly went into Craftsuprint and saw this decoupage and loved it. So here is the card I made. Lynda's black card also from creative crafting world. Black n white stripe backing paper from the Internet. So I am going to take this to work hope she likes it.